Day 15 of World Cup actions sees the very last four matches of the group stages, with all of group G and H squads participating on this day. With the hopes of the Germans defeating the Americans, this match gives hope to both Ghana and Portugal to advance to the next round with a win (and some goal differential help). With that in mind, this was promising to be a good attacking match. After news of Kevin-Prince Boateng and Sully Muntari being sent home after various verbal and physical attacks on Ghanaian staff, the Portuguese were fancying their chances of progression. The Portuguese looked in the mood early as Cristiano Ronaldo shot from the right wing hit the crossbar. Other than the Ronaldo crossbar, the first 15 minutes were mostly played in the center of the pitch, with neither squad being able to penetrate the opposition defensive line. In the 19th minute another scoring chance for Portugal as Ronaldo put his head on a cross, but his point-blank header went straight into the Ghanaian keeper, who made the save. In the 30th minute, a Portuguese ball into the Ghanaian box was met by the knee of Ghanaian defender John Boye who put the ball into his own net while trying to clear the ball. After taking the lead via the own goal from Ghana, the Portuguese pressed on, looking for as many goals as possible (needing a few, given the USA would lose to Germany). The second half would be a “do or die” kind of situation for both squads, but in the first five minutes it did not seem as if either squad would have the energy to turn this fixture in their favor (even though Portugal was up 1-0, they would likely need at least a couple/few more goals to advance). But in the 57th, Ghana found the energy to tie things up after a quick attack on the left flank, and a cross into the box was perfectly headed by striker Asamoah Gyan to the back of the Portuguese net. Just three minutes later, Ghana would miss their big chance as Majeed Waris failed to put a point-blank header into the net after a near perfect cross from Gyan. In the 80th minute the Ghanaian dreams of another round of 16 appearance in the World Cup would shutter, as defender Boye was again in the midst of the action heading a crossed ball directly up in the air which Ghana’s goalkeeper had to punch out. But the ball landed favorably right at the feet of Cristiano Ronaldo who tapped the ball into the net, scoring his first goal of the competition. After a few more attempts by Ronaldo, the match ended unfavorably for both squads, both being eliminated from the 2014 World Cup. When placed into Group G, this tournament’s so-called Group of Death, few experts or fans gave the United States National Team much hope of progressing. Besides the obvious powerhouse and one of the favourites to win the tournament in Germany, they were also grouped with the Cristiano Ronaldo led Portuguese and one of the strongest sides from Africa in Ghana. After a late winner in their opener against Ghana, the Americans found themselves 2-1 up over Portugal with only seconds to play in a thrilling contest on Sunday. Portugal were able to conjure up a late equalizer through Silvestre Varela though that delayed the American’s celebrations. Going into the match against Germany today there were several scenarios that could have played out. With a win or a draw the American’s were through to the next round, but if they were to suffer a defeat the US would need some help in the other match between Portugal and Ghana. A heavy defeat to the powerful Germans would mean curtains for Team USA. In the opening ten minutes the Germans piled on the pressure and could have easily scored two goals before the Americans had a foothold in the match. Eventually, the US began to play their way into it and looked threatening a few times on the break. Sporting Kansas City winger, Graham Zusi came close to an opener in the 23rd minute when his shot from 25 yards just cleared the German bar. Despite the torrential rain, and the fact that a draw would see both sides through, any thoughts of a dull encounter were quickly dispelled as both sides looked to go for a win. With Bastian Schweinsteiger in particular becoming annoyed with the physical play of Jermaine Jones and Kyle Beckerman, there was an edge to the game that many felt would be lacking. The Germans are one of the favourites in this tournament for a reason though and began to craft further chances of their own, with Lukas Podolski and Mesut Ozil coming close to breaking the deadlock. With Miroslav Klose on for Podolski at the half, the match swung decidedly in the German favour as Toni Kroos, Philipp Lahm and Schweinsteiger began to dominate the centre of the pitch. 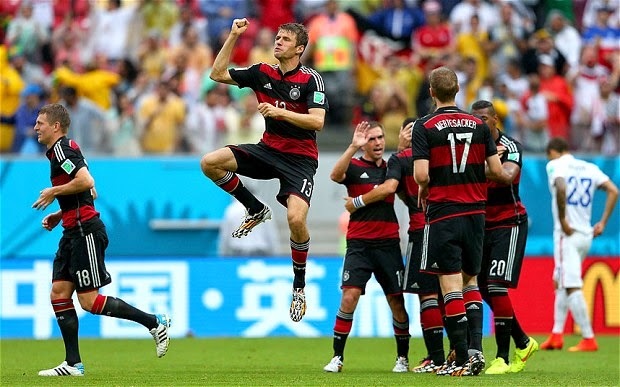 It was no great surprise when they took the lead on 55 minutes thanks to an incredible strike from Thomas Muller. There were further nervy moments from the Americans almost immediately after, as news filtered through that Ghana had equalized against Portugal. If the African side could take the lead in that one, and if their own score stayed as is, the American’s would be out. Fortunately for Team USA, they found a hero in the unlikely form of Cristiano Ronaldo, as the Portuguese maestro finally opened his account in this difficult tournament for him as his side. With Portugal leading Ghana 2-1, and some way off of the NFL sized score they’d need to progress themselves, the US could essentially hold out for a 1-0 defeat and still go through. Regardless though, the US did craft two late chances to tie up the match, but it was not to be as the Germans held firm and deservedly won the group. Both teams advance by virtue of the results today and will both prove to be tough opponents for whoever they draw in the next round. With a round of 16 spot on the line, a draw or win for Algeria should be enough for s trip to the next round. For Russia it was win or go home. Russia wasn't going to wait long and striker Aleksandr Kokorin met a cross into the box perfectly with his head, giving the Russians a 1-0 lead in just the 6th minute. But after the initial goal the pace of the game slowed dramatically as both teams were playing an often sloppy style of football. And just as it started, the first half of the match ended without any other real goal chances aside from an Algerian header that went straight into the Russian keeper’s hands, and another that saw Akinfeev make a good save. In the 60th minute, after a few attacks from the Algerians that ended in no discomfort for the Russians, Islam Slimani tied the game up scoring the match’s second goal from a header after a good free-kick cross into the box and Russian keeper Akinfeev misjudging his ability to come out to collect the ball from the air. Russia had just 30 minutes to find an answer, otherwise the hosts of the next World Cup would be eliminated in the very first round. After the Algerian goal Russia did start showing some signs of life, with a more attacking style of football. Unfortunately for the European side, their sloppy midfield play and lack of creativity up front did not create any real scoring opportunities for the rest of the match. History for Algeria as they move on to the round of 16, while Fabio Capello exits after just the first round as a coach for the second straight time. 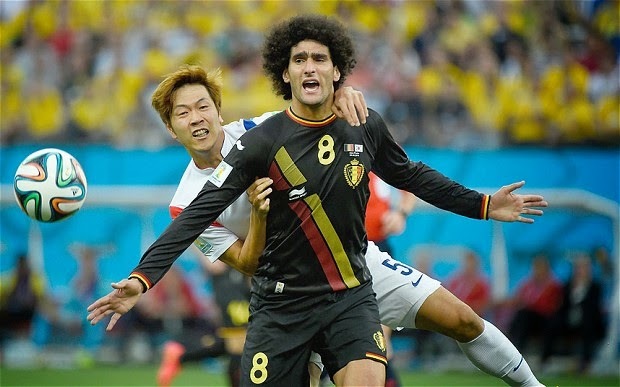 With Belgium already assured of a place in the Round of 16, with the group all but wrapped up, and Korea needed an absolute miracle to progress this game didn't hold a lot of interest for neutrals. Belgium, who had been the hipsters dark horse of choice leading into the World Cup, have been dull in the first round and may qualify as one of the poorer sides to ever come out of the opening round of a tournament like this with maximum points. One hopes that they'll open up a bit more in the knockout stages. A dreadful first half where not a lot happened, was enlivened only when Steven Defour was sent off at the end of the half for a spiteful stamp on Kim Shin-wook. Korea, who have been very poor at this tournament and were on the end of a thrashing against Algeria the last time out, tried diligently to press their man advantage, with chances falling to Ki Sung-Yueng and Son Hueng-Min. But Thibaut Courtois was equal to the task. The introduction of 19-year-old Divock Origi spurred Belgium into life and when his shot was parried by Korean keeper Kim Seung-Gyu, Jan Vertonghen fire home the rebound to give Belgium maximum points in the group. Kon got the Germany and Belgium wins correctly but without exact scorelines. Iain also guessed two outcomes correctly, but also got the Algeria-Russia scoreline right. Pedro got three outcomes right but without the right score. We'll give this one to Iain since a correct scoreline is much harder to guess than just the outcome of a match.